Having recently discussed Subway and having recently consumed a Togo’s sandwich not even worth discussing (pictured here for the curious), I thought it was high time to discuss a franchise sandwich eatery that actually does a few things right. 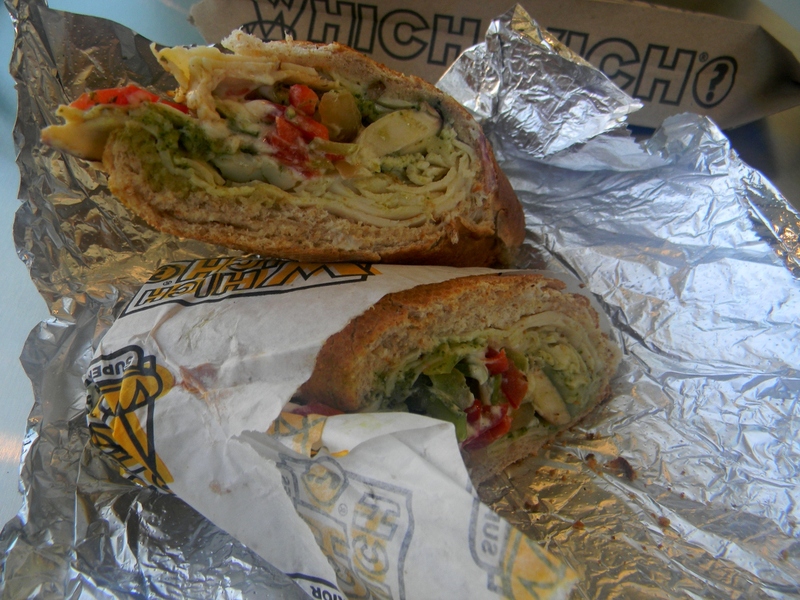 Which Wich is a chain of less than 150 locations, with a central gimmick based around a highly customizable sandwich. Upon entering, the consumer selects a brown sandwich bag with a pre-printed menu, choosing from a half dozen categories: chicken, beef, veggie, etc. Then, marking the bag with red pen, the customer selects the type of bread, size, cheese, spreads & mustards, veggies and other accouterments. The menu is lacking in specific sandwiches, just presenting vague archetypes like “Roast Beef” or “Chicken Pesto.” Where in most sandwich shops the roast beef is already explicitly laid out, at Which Wich it’s almost entirely up to the consumer. While I do enjoy seeing what other people put forward as the ideal sandwich, the sheer number of options available make a fine substitute. Eleven cheeses are available, from the standards to feta to cream cheese. You can chose from four mustards, nearly a dozen spreads and sauces, onions three different ways, more than a dozen vegetable options and more. You can only get two types of bread, white or wheat, but the vast number of options available suggest not an establishment hamstrung by limited vision but one bolstered by supreme focus. Rather than hiding behind gimmickry, Which Wich seems an honest attempt to do things well. For my part I went with the chicken pesto, adding mozzarella cheese, caramelized onions, bell peppers, mushrooms, garlic powder and salt & pepper. It wasn’t a fantastic sandwich, but it was far and above what you might expect from your average franchise affair. I’m reminded of Lenny’s, the quality NYC chain that has been around longer but has a far smaller reach. The bread had a nice crunch to it, nothing in the sandwich was overpowering. The chicken was sliced cold cuts, but better that than a dried, salty chicken breast, no? Altogether, Which Wich puts forth a perfectly competent sandwich. And given the more dreary options on offer from the larger players in the sandwich industry, perfectly competent is as fine a result as one could hope for. This entry was posted in Sandwich Reviews and tagged Chicken, Sandwiches I Have Eaten, Sandwiches Made For Me by Pete. Bookmark the permalink. Reading this, I was instantly reminded of a sandwich I had in Bulgaria. I don’t remember where in Sofia it was, or the name of the shop, or any other details. I remember eating next to an old man smoking, and I remember that it was chicken. Thank you for that pleasant, if two-thirds forgotten, memory. There was just a review in my local paper (the San Jose Merc) about Which Wich, and it absolutely loved it. I’m always skeptical of any newspaper review so I immediately came back here for reference. The fact that you enjoyed your sandwich, while not completely overwhelmed by it, gives me hope for it…I think I’ll have to give it a try. I’m glad we can provide you with trusted information! I’m not going to ride all the way out to the plant to go again, but if it were some place I passed by regularly it would likely become a decent option for a fellow in a hurry.